Why is my picture showing up next to emails I send? - Ask Leo! Why is my picture showing up next to emails I send? It's really nothing to worry about; the recipient's email program is likely grabbing information from your profile. There may be something you can do about it, if you care. One of my email contacts sees an image, which is next to my name at the top left side of the email that they’re viewing. Other contacts don’t see this image. I’ve not knowingly put this image there. The image has a URL link, which goes to Facebook. Do you know how to stop this image from appearing? My belief is that this boils down to Facebook. But things like this – profile pictures and email being shared – are happening more often. Fortunately, there’s little cause for concern. I’ll explain. Many email programs now attempt to provide more information about the sender when an email is viewed. When the program displays the email, it automatically goes out to the internet to see what it can find that’s associated with the “From:” email address. 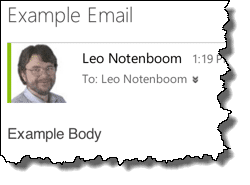 If a picture is available, the program displays that alongside the email when it draws the email on the screen. It’s not in your email. It’s actually a function of whatever email program that the recipient is using to actually look at your email. The picture is one that you’ve made public somehow. It’s most likely a profile picture on some online service or social media site that is somehow associated with the email address that you’re using. Blame may be a strong term, but let’s just say my first thought is Facebook in this case. Facebook is notorious for defaulting things to have more public access than we often intend. They often will make your profile picture public and it is possible that they could even make your email address public. The net result is that email programs that are trying to provide this functionality for the recipients have that as a resource. Another possibility is that you have a profile picture on a Google account, and your recipient is reading your email in Google Mail – or Windows Live and Outlook.com. Personally, I wouldn’t worry about it too much. It’s something that’s just happening on the recipient’s email program. If you are concerned, then you’ll need to spend some time reviewing the privacy settings for Facebook or Google or any service in which you have a profile picture set, particularly social media services. Part of what they’re doing is probably in the name of being social: providing your image when email programs ask for it. Why Are Pictures not Showing in Email? - There are many reasons you might find pictures not showing in email. I'll review the complex world that is email, and some of the things that can go wrong. How Do I Put a Picture into the Body of an Email? - Depending on what email program you use, putting an image into the body of an email can be easy, difficult, or nearly impossible. Why Can’t People Click on Links I Send Them? - Ninety-nine percent of the time when links aren’t clickable the problem is on the receiving end. It’s usually because their email program is trying to protect them from something that looks suspicious. « Previous post: What’s an exploit? When I type my name in the google search bar, my google profile comes up, but it shows my personal email addresses. How to I stop them being shown publically. Google only shows search results. So I’m thinking that you may have posted your email address to a forum someplace along with your name. You may want to follow the links and see if you can’t get that removed from what ever site it is on. I do not have Facebook. How do I fix my problem, this has never happened before. It could come from a number of sources. As the article suggests, any social media subscription or other online service you’ve associated your photo with. No way of knowing without being able to look at your computer. You can can check the URL of the photo in the email to see the source of the photo.